CFA EoC Qs - No time..? Hoping for a little guidance with regards how to best spend the 8 weeks until exam day. Any good ideas welcome, I’m thinking maybe I should just skip the CFA EoC Qs and go straight to their Qbank before smashing out as many mocks as I can obtain. I just think there is way too many CFA EoC Qs and they’re so detailed I am wondering if it’s overkill? Probably not but in the interest of time please share some guidance. I personally did not do all the EoC questions and didn’t go back to review the questions that I did solve. I spent last month before the exam doing mocks (total of 4-5), CFA portal questions and reviewing the material. For the last couple weeks, I ‘ve been reviewing MM review videos and doing EOCs after. Some EOCs are really long, and some are short. The ones that had almost 40 questions I would skip, which I in some extent regretted. Once I watched all review videos for a particular topic, I did CFAI topic tests on that topic. CFAI topic questions are much easier and cause less headache. It took 2-3 days to finish each topic questions set. Now after I did all CFAI topic Qs, I feel that I have rushed a liitle bit. If you have time to do EOCs, do them, since you still have plenty of time. After EOCs, CFAI Qbank becomes very easy to handle, IMHO. Thank you for the input. 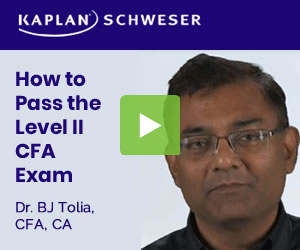 I have also spoken to a couple of colleagues who have passed the level 2 exam and I have decided to do Schweser Qbank Qs to refresh my learning before doing the CFA Qbank and then mocks. If time permits I will tackle a few of the trickier CFA EoC Qs afterwards but my colleague made a good point by saying that the extensive CFA EoC Qs are there to drill in the knowledge much like the Schweser EoC Qs (complete) and that I should be getting familiar with the ‘language’ of the CFA exams by doing mocks rather than trying to just drill in the knowledge at this stage. It’s amazing how much you struggle to recall once you have initially gotten comfortable with the study material and by amazing I mean total BS. Let the frustration commence!